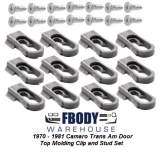 This is a set of 12 door top molding clips for 1970-1981 Camaro and Trans Am. 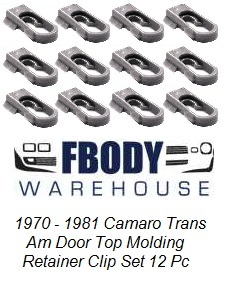 1970-1981 Camaro, Firebird and Trans Am, replacement clips for the deluxe exterior door top chrome trim. Units fit not only the door studs but also the trim tight as a glove and are correct for replacement of your broken missing or simply aged GM installed units. 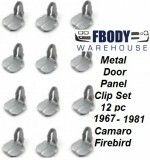 Set includes 12 clips, and there are 6 clips per door. 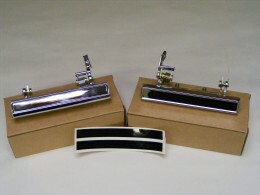 Install is a snap and this is a must have for the person looking to properly restore their car!